In September 1996 Brisbane City Council commissioned a series of 32 plaques as part of the completion of the Albert Street urban refurbishment. On these plaques the Albert Street Literary Trail was born. Quotes about Brisbane from 32 Queensland writers were chosen for the plaques. Running all the way down Albert Street, from King George Square to the City Botanic Gardens, the authors represented include Steele Rudd, Oodgeroo Noonuccal (Kath Walker), Thea Astley, and David Malouf amongst others. A Map and list of all authors is available on the Archived Web Site, and there is also a guide available from the Museum of Brisbane. At the time, the quotes were chosen with the the contribution of the then Griffith University's Queensland Studies Centre . They assisted in selecting a cross section of authors and quotes for the trail. All are Queensland writers and most are from Brisbane. The plaques themselves were illustrated by artist Brona Keenan in collaboration with graphic designers Dot Dash and the Brisbane City Council's Urban Design Unit. They are cast in bronze. If you search the Brisbane City Council's Public Artworks Database for "Albert Street Literary Trail" you can see digital photos of each of the actual plaques, as there are far too many to cover off in just this one post. Better yet, rather than look at pictures on the web, why not wander down to Albert Street and check out the plaques for yourself. Although not all are in the best condition, on most you can still enjoy the quotes. There's a range of coffee shops and restaurants where after you've chosen your favourite quote, you can sit down and read the book it comes from! The Roma Street Parkland is a sub-tropical garden covering 16 hectares. When you have kids, particularly young children, trying to entice them to walk around the Parkland after they've played in the parks there can be quite difficult. That is where the Trains 4 U service can come in handy. The trackless train runs a circuitous route around the parkland, with stops at the Carriage Shed, and at the playground behind the Spectacle Garden. The 1.3km round trip takes around 15 minutes to complete. A synchronised commentary runs throughout, outlining the various sites and garden precincts of the Parkland as you traverse the route. It runs weekdays from 10:00am to 2:00pm, with extended hours on weekends, 10:00am to 4:00pm, weather permitting. 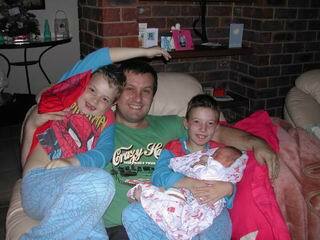 For a family, 2 adults and 2 kids and a baby in our case, the fare runs to just under $20. Trains 4 U also caters for birthday parties (2-6yrs), corporate events and weddings. There seem to be two trains available, the Jelly Bean Express or Lollipop Express. Both are easily seen and colourful, which makes them a big target for the whole "Can we go on the train, Dad?" calls from the kids. To rest your feet and stop the kids yelling its worth it! On any given day as you wander down Queen Street Mall, you can find street performers sharing their talents with tourists, visitors and shoppers. Busking is alive and well within the city. Saturdays seem to be draw a reasonable number, and they are dotted throughout. They range in variety from musicians, such as the blind saxophonist, aboriginal didgeridoo players and the seminal guitarists, through to mime artists, balloon artists and street artists sharing their wares. Most derive their income from using their talents, and some are very good. To busk in Brisbane, particularly in the Mall or at Southbank, you need to get a busking license. Brisbane Marketing provide a fact sheet on how to go about getting the required permit. Auditions are held quarterly, and there are no limit to the number of permits, but you do need to meet their criteria. Busking is defined as playing a musical instrument and/or singing, conjuring, juggling, mime, mimicry, dance, puppetry, performance art, recitation and other appropriate theatrical and visual forms. There is an excellent article on Buskers in the Mall by Hideki Kubo. He includes recordings of the various performers, including "Mark" who plays Charlie Chaplin and has been doing such here for 9 years. He is particularly good with kids, and spent a few minutes cleaning up my boy with a feather duster after he put some money in the slot. Hideki has also interviewed is Mister Balloons, David Pearson, another long time performer. The balloon sculptures he comes up with in extra quick time are quite amazing. How lucky are we that for the cost of an Aussie gold coin, we can get some great live performance which brings smiles to all. Net is a stainless steel sculpture which adorns an outside wall at the entrance to the Neville Bonner Building at 75 William St. As part of a public art commission in 1998, the artist Barbara Heath has again demonstrated her significant jewellery skills by creating this large interlinked set of rings. These form the shape of an elongated cylinder running down the side of the building. The Neville Bonner Building recognises the contribution to Australian public life of former Senator, Neville Bonner, AO. It is a permanent reminder of Mr Bonner's distinguished career and contribution to Queensland and Australia. Neville Bonner was the first Indigenous Australian to be elected to the Parliament of Australia. In reading reviews at the time, my interpretation is that this sculpture refers to related themes of the area's original indigenous inhabitants including interconnectedness with the land and river, and their associated fishing practices, hence "net". 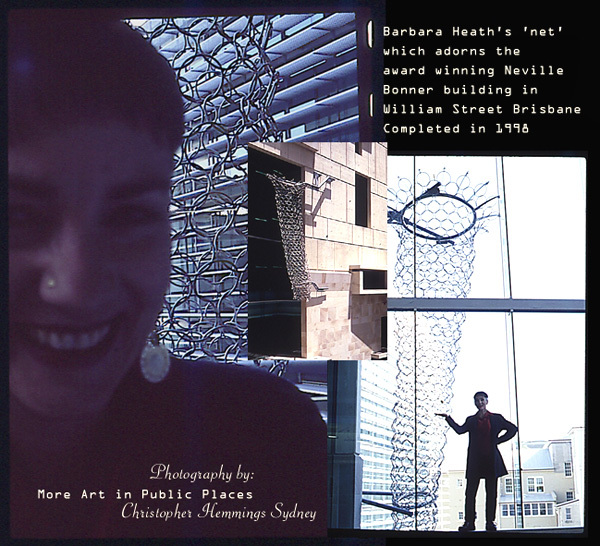 Barbara is certainly active throughout the Brisbane artistic community with both her work as sculptor and jeweller. I find it refreshing that not only does she do great work which earns her an income, but that she actively pursues public art and design projects. This, to me, allows her to give back to the community and allows us all to appreciate her craft. I've also had the pleasure of being in communication with one of her colleagues Malcolm Enright who has provided valuable insight into her work, as well as providing further resources on the wonderful city that we live in. Australia and New Zealand commemorate ANZAC Day on the 25th of April every year. The day was marked initially to remember members of the Australian and New Zealand Army Corps (ANZAC) who landed at Gallipoli in Turkey during World War I. That tradition has been extended and the commemorations recognise World War II veterans and returned servicemen and women from the conflicts in Malaya, Indonesia, Korea and Vietnam, veterans from allied countries and other peacekeepers. In Brisbane thousands lined the streets today to watch and honour those and their kin recognise the day. The ANZAC tradition recognises the ideals of courage, endurance and mateship. Courage, in that many of the young men sent to fight at Gallipoli knew they would face certain death. Endurance, in that the conditions found at the site were atrocious, yet still they soldiered on. Mateship, standing by their friends and comrades, through thick and thin and all hardships and pleasures. I have said before that although I've never served, I respect what the ANZAC represents, these attributes and also in particular the statement "Lest We Forget". To me, this means that we should never wish to make war, lest we forget the sacrifice of those who have gone before. War is such a terrible thing. Today I took my eldest boys to watch the 10:00am march in the city centre. We watched the F-18's fly over, and sat amongst the many onlookers watching past and present servicemen parade. We also went to the ANZAC Memorial at ANZAC Square. There were representatives from Army, Navy and Airforce, along with horses and various military vehicles. It was easy to applaud these dedicated men and woman whose service means so much to our country. I am amazed at how much pride I feel watching these people enjoy and be lauded for their efforts. All are there to recognise and remember the fallen. The Ode of Remembrance states this best. For nearly 50 years Festival Hall in Brisbane hosted a showcase of international and local performers and activities. At 4,000 seats it accommodated most large concerts during its era. This ranged from perhaps the most renowned performance, the Beatles on 29-30 June 1964, through to the final major gig there, that of Michael Franti on August 9th, 2003. Located within the foyer of Festival Towers, an apartment complex built over the site, the Festival Hall Walk of Fame commemorates the history of the site. The display in the entry lobby consists of a wall-mounted installation of backlit panels. The entry display is to the Beatles, with the main display incorporating original seatbacks from Festival Hall, with images of performers and other significant figures in the Festival Hall history. Not only are concert performers featured, the venue was used for Wrestling, Ballet, Political Debate and Boxing, particularly as a venue during the Commonwealth Games. There are also concert ticket stubs replicated throughout. You only need to search Google to find reference to the vast number of performers who played there. From Johny O'Keefe, Billy Thorpe, Frank Zappa, the Bee Gees, the Police, Duran Duran, Powerderfinger and Silverchair to sparsely name a few, it was the city venue to play. There is nothing which has come close to replacing it as the smaller venues in the Valley, whilst intimate, can't hold big acts, and the large stadium venues are purely for the likes of Robbie Williams. However, at the moment the music scene is going right off in Brisbane so they're all still coming! Hopefully all artists can visit this walk and realise the path trodden by so many other greats to get here. In this ANZAC week, its appropriate to recognise another of the features of ANZAC Square. The Queensland Women's War Memorial is located on the western wall of the Square, below the Shrine of Remembrance. It was unveiled in 1932 as an initiative of the then Brisbane Women's Club and funded by public subscription. bas relief in Helidon sandstone depicting a number of soldiers and horsemen with horse drawn guns in a military procession. This is highlighted with the inscription above which reads: "Erected by the Women of Queensland in memory of those who lost their lives through The Great War 1914-1918". The commemorative lettering surrounds a bronze laurel wreath. The second component is the drinking fountain which is made of bronze and sandstone. The interesting element of the fountain are the sculpted dolphins which hold it in place. With work which has recently been undertaken at the square this area has been given a renewed lease of life. The detail of the relief is quite amazing, and shows the sculptor near the heights of her talent. Originally the memorial was to be just to servicewomen, however in 1929 the Women's Club decided to extend it to all the State's war dead. A truly fitting tribute. The Spectacle Garden is one of the precincts of the Roma Street Parkland. Located in the centre of the parkland, it offers a collection of colorful and unique flowering and foliage plants, selected from throughout the sub-tropical world. These are displayed in a number of specialised theme gardens. This is the horticultural heart of the Parkland. These shots are predominantly from the area around the Concentric Garden. The stainless steel sculpture Concentric Intersection by Wendy Mills forms the focus of a lot of annual flowering plants, although the drought continues to have an effect on what can be displayed. The Spectacle Garden features several themed gardens including the Topiary Maze Garden, Lilly Pilly Garden, Traditional Brisbane Garden, a wall of Epiphytes and an extensive collection of herbs. One of the great things about the Internet is that you can do a virtual tour of the garden online. Modelling the The Spectacle Garden Walk, the virtual tour takes visitors on a visual trail of the areas. I'd encourage anyone who's not from the area to get online and have a look, but if you're a Brisbanite or tourist you should go there in person yourself. On the footpath outside Queens Plaza on Edward Street is the sculpture Echoes from the North. Commissioned in 2004, the sculpture was created during 2004-05 by prominent Victorian sculptor Augustine Dall'Ava. Consisting of three distinct pieces, the bold colours used add a colourful impact to the street scape. The associated plaque outlines that "the form and highly reflective metallic colours are visual signifiers associated with Brisbane and the natural environment of the state of Queensland." Augustine Dall'Ava was born in France in 1950 before being brought to Australia at a young age. In the early 70's he did a Diploma of Fine Art in Sculpture and in 1994 received his Master of Fine Arts. He has held various lecturer positions at prominent Victorian Universities. He has had numerous solo and joint exhibitions, and has a strong reputation as a published author. He has also won various awards for his work. In one particular review of his work I read, he notes that "I fight gravity tooth and nail...". This is quite symbolic of this work, with the perched cube and crescent flame on two of the pieces looking precariously placed. I like how the reflected colours of this piece change depending on the sunlight. In the middle of the day they are bright and effusive. As evening comes they take on a more sombre hue. Jade Buddha is a bar and casual dining restaurant located at Eagle Street Pier. Open from 11:30am until late each day, it offers restaurant food with a pan-Asian flair, along with casual drinking in the Jade Lounge. Their menu offers a range of options. Outside views encompass the Brisbane River, whilst inside, the design and decoration features sculpture and decoration befitting Feng shui principles. There is even a large golden Buddha to greet you. Formerly City Rowers, the venue had a significant overhaul in 2005. They have a varied array of activities on each week, including Speed Dating, Buddha Night and themed menus. Above Jade Buddha is the Shadow Lounge, which offers a unique, intimate, club-like venue with open views over the river. The main focus is cocktails and champagne, with a wide array of exotic concoctions available. The seating is definitely casual, and if you're lucky you can get into one of the deep sofa chairs which are just great to melt into. The venue is also available for corporate and private functions. Go to their web site if you want to see it in all its glory. As part of one of the premier dining areas of Brisbane, Jade Buddha is perhaps better visited at lunch time rather than dinner, particularly on Friday or Saturdays. That's when the party crowd is out and about, so your more likely to experience surly bouncers and drunken party-goers. Depending on what scene your into, this can either be really cool, or a bit disappointing. As I'm getting older, I'm more accustomed to a relaxed drink rather than po-go slam dancing like I used to when I was young. The Shadow Lounge upstairs is particularly good for that relaxed drink! Broadway on the Mall is located at 170 Queen Street Mall. The centre holds many specialty shops over four levels, with a focus on fashion and bridal. There is also a large Harvey Norman electrical retailers store, as well as a a food court on the basement level. There are a number of cafes and restaurants spread across the levels. It spans from the Mall through to Adelaide Street. Natural sunlight helps light the centre via the large overhead glass atrium. It is open every day with normal Brisbane shopping hours, generally from 9:00am through to 5:00pm. As I wandered around, I became enraptured by Winnie Bridal, on the top level. If you were planning a wedding in Brisbane, this looks like it would be a great place to get ideas. Its on the very top level, with a wide bay window displaying the various available dresses. Designs are by Winnie Yeung, a French trained Haute Couturier who has won multiple Fashion Awards, and has established herself as a Hall Of Fame Fashion Designer in Australia. If I go here, because I'm a bit of a nerd, I go to Harvey Norman mainly to see what's the latest and greatest in computers and TVs. If you want to see big screens, and all you've got time for in your busy schedule is city shopping, this is a good place to get an idea. Its also slightly nerdy fun to ride up and down the escalators. It seems it was designed so that if you want to look around you got fed upwards, ever upwards, and then to escape you have to wind your way down past everything. Brilliant marketing and design. The Aurora Tower at 420 Queen Street is currently the tallest building in Brisbane. With 69 floors and at an overall height of 207 metres it is visible from many suburbs outside the CBD. It comprises 18 penthouses, 54 skyhomes (two storey luxury apartments) and 408 apartments. There's also a recreation deck with pool, spa, gym, sauna, and mini cinema. Centrally located, if you were into inner-city living it would be a great place to live. Aurora Tower was opened on May 5, 2006. The interesting thing about this building was the inclusion of the facade from the old Queensland Country Life Building. At 432-440 Queen Street, it has been incorporated, as you can see, into the fascia of the Aurora Tower. This dates back to 1888-89. In the late Victorian style, it is an example of Richard Gailey's work, a prominent architect of the time. Note the well maintained and restored rendering, Corinthian columns and intricate cornice work which has been done. This is a fantastic example of how the old and the new can be brought together. We have a great new building, providing residential accommodation and many high technology components befitting a building of the 2000's. Juxtaposed with this is architecture from more than a century prior, showing the intricacies and engineering skills of craftsmen without any of the benefits of modern technology and design. Its brilliant, and another reason why it is so great to live here. The Brisbane Visitor Information Centre is located in the lower Queen Street Mall, between Edward and Albert Street. The centre is open everyday from 9:00am, generally to around 5:00pm. It is open until 7:00pm on Fridays. It features a wealth of information about what's on in and around Brisbane, and features booking desks, interactive touch screens, brochure and map racks, automatic tellers, as well as a transport information window for local transport schedules and ticket purchases. The Visitor Information Centre is run by Brisbane Marketing with the assistance of Brisbane City Council. The staff are incredibly friendly and helpful, even with the large influx of tourists which are generally found there each day. There were over 4 million domestic visitors to the Brisbane region last year, and around 800,000 internationals, so having a centrally located information hub is incredibly important. You can see why it is so busy! This is really a fantastic resource not only for tourists but for the people of Brisbane as well. You can find out so much here. They have a booking centre for travel and tourism bookings, and I really love how they've set up the interactive touch screens. Its like a big computer screen on glass, which you just touch to browse around with. Very cool, and if I can get the hang of it even with my latest lack of affinity with computing technology, then anyone can. One thing which has fascinated me about Brisbane is the number of buildings which are covered in plant greenery. Even in this age of drought and water restrictions, around the city there are a number of buildings where even palm trees are the norm. I've tried to capture this to some degree in this post, when as I was walking down Adelaide Street, I came across two such instances. This is by no means unique, and I must stress that for any visitor to Brisbane, if you look around, you will see greenery everywhere. The first of these is what appears to be a small plantation of bamboo which masks the Zen Bar at Post Office Square. If you ever have the opportunity to eat here, and they do fantastic Asian food, you get a wonderful view of both the park and what appears to be an Asian garden outside the window, rather than your standard streetscape. This is at 215 Adelaide Street. Further up the road towards Wharf Street, one of the office buildings is quite literally covered. The three tiered balcony at the base of the building is currently covered in overflowing garden beds, interspersed with large palms and other trees growing up through the concrete. On each of the central balconies all the way up the spine of the building it is like an urban oasis. Colourful flowering plants reach to the edge and beyond each balcony. This is so much better than a drab grey building or shiny steel modern monstrosity! With our sub-tropical climate, even in drought these areas seem to continue to flourish. I love it! "Hey Brisbane, Do You Know How to ROCK!?!?" Just like in Spinal Tap, can you imagine how many bands have played some of the more famous venues in town or the Valley, and yelled those immortal words? Well, if you're like me and you're out and about with your Homer Simpson "Born to Rock" T-shirt on, and you come across a sculpture which epitomises that, you have to stand next to it and get your kid to take your photo. I wanted to do the whole air guitar pose, but my son wasn't quite up to working the camera out well enough to get that kind of shot. Besides that, the baby also wanted to walk up and around and see what was going on! If you come in from the College Road entrance to Roma Street Parkland, at the top of the park you'll come across this sculpture. Entitled Automatic For The People (ROCK), it is made of stainless steel and is almost 3 metres high. Perhaps REM's Album of the same name had some influence on the sculptor Scott Redford. As mass production is an integral part of contemporary culture, ROCK was fabricated using the same methods as industrially fabricated goods. I found it interesting in reading some of the artists reviews, he has said that he doesn't like artwork which acts as a form of tourism, however here we have a piece which I think many tourists to the parkland would be drawn to. However, as is an artists want, he seems to have moved on since 2000 when this work was commissioned. There is the other association to the landscape of the parkland, but to me this work and its discrete reference to one of my favourite bands is always going to scream Rock and Roll. In the City Botanic Gardens there is a large Banyan Fig on the QUT Gardens Point campus edge. Planted in 1870's and native to India, the Banyan fig acquired its name from the Hindu merchant caste, the Banyans, who set up there stalls under the shelter of the trees. It is renowned for its vast growth and the aerial roots it sends down to support branch growth. Although this tree is quite large, in their native India they have been known to expand to well over a hectare. In Hindu religion, the banyan tree is considered sacred. It represents eternal life because of its seemingly ever-expanding branches. A Hindu belief was that the Brahman represented itself as Banyan Tree with the spirit living on in these trees. Because of this belief, they are encouraged to grow and are rarely pruned in India even though their roots can cause significant damage to any surrounding buildings and temples. Like the similar Moreton Bay Figs, this fig tree is quite spectacular. If you had one of these in your backyard, you wouldn't have space for much else - but it would be better than any cubby-house. For a game of hidey-chasey they provide ample spaces to hide, and its great to climb into the trees so that any kid who tries to chase you can't quite reach. Another of Cezary Stulgis' commissioned works is at 540 Queen Street. Entitled The Passenger it was sculpted in 2003. Created from welded mild steel with a stainless steel background, the represented figure to me is your classic everyman riding the train either too or from work. On closer inspection, you find that it is actually an original Brisbane City Council bus window which has been used. Located on Queen Street at the base of Willahra Tower, I can only begin to imagine how many people either drive or walk past this figure each work day. I bet if they're feeling a little blue from sitting in traffic they think, "Well, at least I'm not standing on a bus/train like that guy!" The furrowed brow, slightly pursed lips, and well worn suitcase suggest a man well travelled - although we're left to ponder if this is another of life's circuitous journeys, or a different path to another adventure again. I'm also reminded of the song about apartheid, Passengers, by Elton John from the 80's everytime I see this work. David, over at Brisbane is Home has already featured this particular sculpture. Its great to see that I'm not the only one appreciating these fine works of art throughout our great city. I can't help but quote Cezary again by taking these words from his own site... "As public art, figurative sculpture is a truly magnificent way of embracing our humanity and reflecting upon our culture."